With all four elements embedded (specially water and earth were present), one of the most notable metal festivals in the world celebrate its 23rd years anniversary. Metal and beer thirsty visitors were warned weeks before that there were no early camping this year in the small village named Wacken during extreme rain in north Germany. A village well known to most metal heads around the world, The town that host one of the biggest annual metal events every year in the beginning of August. Metalheads Welcome to Wacken! Unfortunately we arrived late at Wednesday, and since the postponed camping for all attendees, we waited four – five hours for the check-in. This late arrival made us camp at the “extra” VIP park far away from everything. 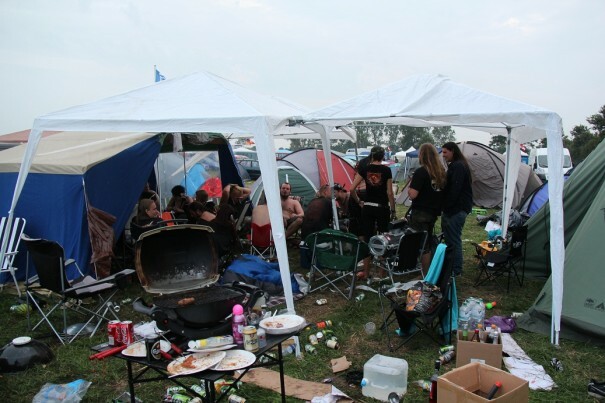 Wacken Metal festival is normally a huge pasture ground for cows and crops, but during August first week it turns into a friendly and joyful battlefield with an infinite mud-pools of tents, metalheads and health hazardous accommodations. 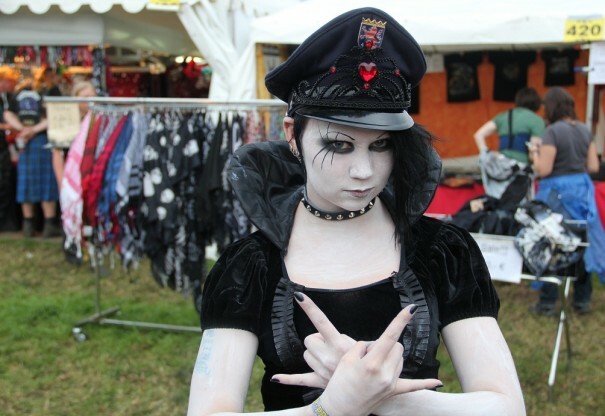 The festival is located a couple of kilometers from Hamburg, and the organizers have trains, buses and all kinds of transport arranged for the metal feast. 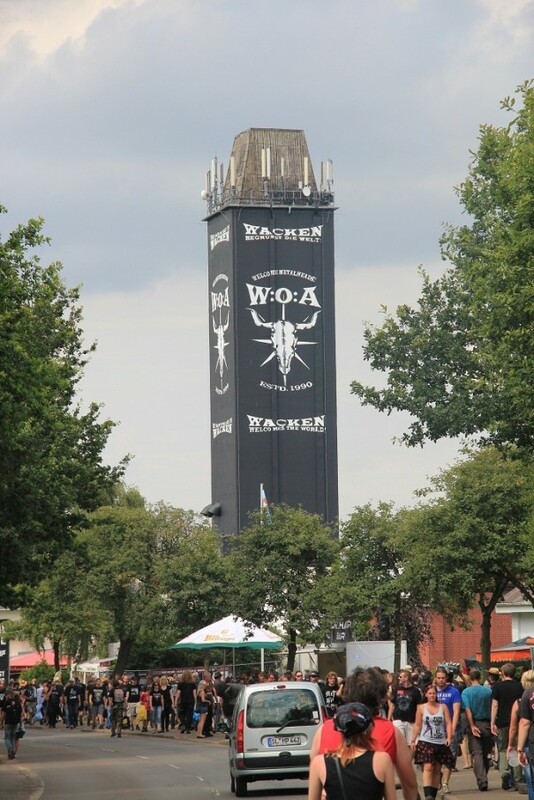 If you never been into Wacken before you´ll be absolutely stunned how huge the festival is. The entire festival area has seven stages, all in different size. The camping ground covers the entire alphabet in areas and at the location it seems like an endless refugee camp. The main stages Black and True Metal stage host the bigger bands next to each other. The third biggest one is Party Stage and are followed by five other stages scattered around the area. Even though the official program starts on Thursday. Wednesday is a warm up day with new and upcoming bands that battle each other for a long term support from the Wacken foundation and a label contract. Wacken today is so much more than just a metal festival. 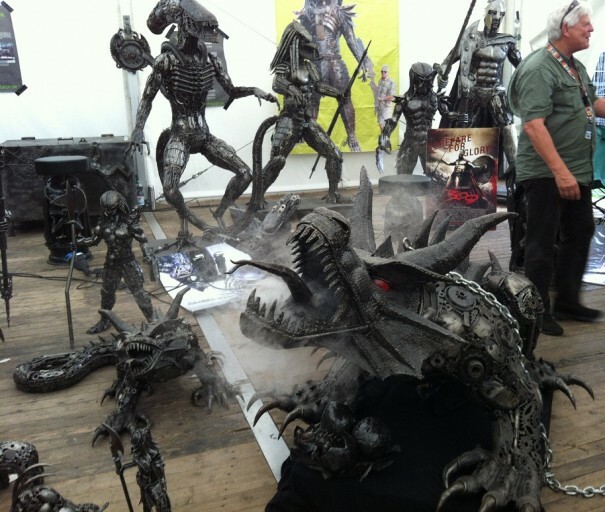 It has its own movie field, Its very own Art tent, football cups, poker and tons of different attractions. A couple of years ago the Wackinger village were introduced. A huge area with Knights and medieval themes, such as fire shows and battle reenactment. This year Thrash Of The Titans Field debuted in the Wackinger village. 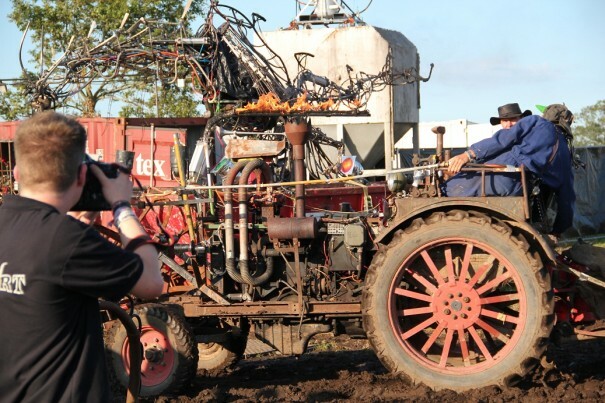 Mad Max inspired cars, rebuild vehicles, bizarre steel constructions were crammed together with fire, burning oil barrels and lots of strange and unique stunts that created a mind blowing atmosphere on a muddy ground. We were invited to the show on Thursday with Swords and burning vehicles and the public found it awesome to see a “Avatar” riding one of the many rebuilt vehicles. 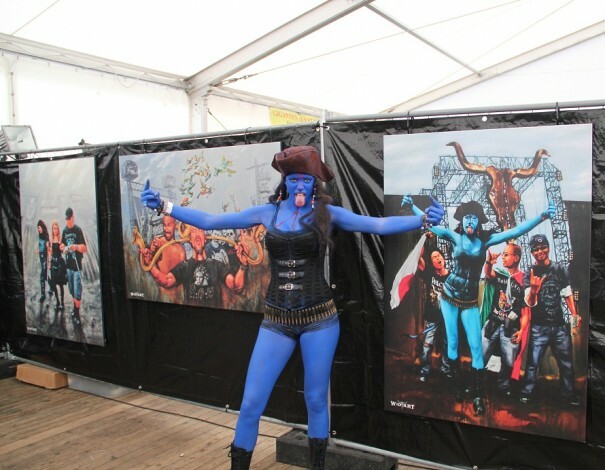 This was made possible since the paint artist Jens Rusch who painted Sarah last year wanted to do some new work on the beautiful blue lady. Another attraction was the improvement of Bullhead City Circus – a giant tent that hosted upcoming bands on W.E.T and Head banger stage. But also wrestling, Metal karaoke and loads of other stuff. Even if the festival organizers updated the tent to model: GIANT, it was crowded on Thursday noon when no bands played on either of the main stages. If you come to Wacken only to see bands you better be on time and plan your schedule. To be in the front row, make sure you get to see the band before aswell, otherwise its overcrowded and you wont make a meter. This happened to us numerous times, during the first day we were so far away from the stage on both Sepultura with Les tambours du Bronx and Volbeat. The only thing you could do was to follow their performance on any of the big screens placed around the area. This is however a great idea for those who want to chill down with a beer or have something to eat while watching their favorite bands. But to get good pictures of the band it’s almost impossible unless you have press card or a telescope with you. When Friday dawned we instantly decided that morning, not to be so late as we were for Volbeat to snap some good pictures on Dimmu Borgir and In Extremo the main headliners on Black Stage that day. 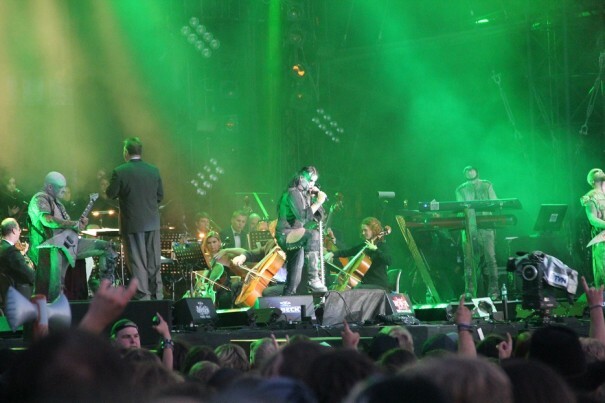 Dimmu Borgir did bring along an entire orchestra and choir for their performance, and created long time memory of a great gig. Imagine at least hundred people on stage all professionals doing there job. This was one of the finest moments at Wacken this year band and music wise. Dimmu Borgir music with orchestra creates goosebumps even to this day. 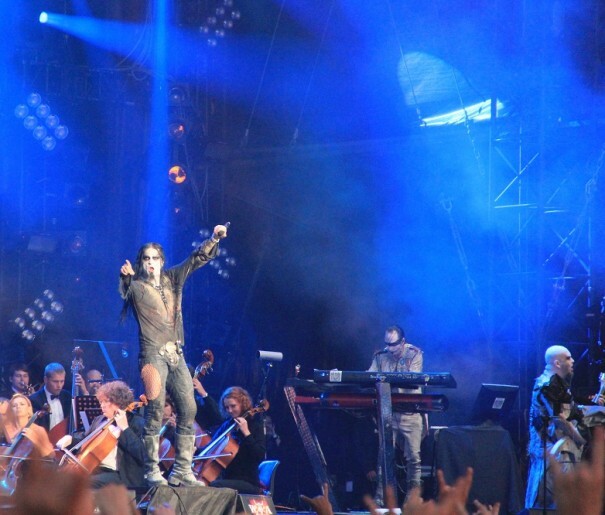 Even Shagrath and the rest of the crew had a hard time to look like “evil black metalers” composing music with the orchestra. Some instrumental songs was done only by the orchestra such as Xibir (intro) and Eradication Instincts Defined also Dimmu Borgir from the latest album Abrahadabra were done with the orchestra, but also together with the band directly after. The amount of lights used at Dimmu Borgir‘s show was also something of a number. Overall an absolute awesome show. 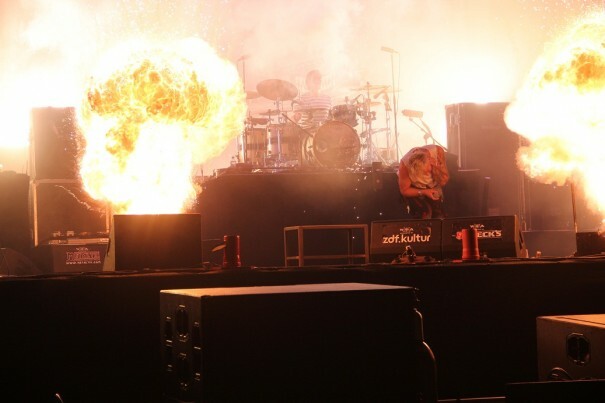 After the show In Flames began with Jesters door. Anders Fridén singer of the well known “Gothenburg sound” band were inside a steel cage chained to the stage ceiling on True metal stage simultaneously with a spectacular light show. The bass on their intro probably changed the heartbeat. When they started with Cloud Connected the volume became so intense that you really felt the music right through you. This was to loud even for hardened veterans. We followed the show on big screen and were the lucky ones to bring earplugs, Lots of people left their spots during the loud volume and lack of earplugs, by far the loudest concert we’ve attended to. Next up a half hour after midnight was In Extremo: Germany’s biggest medieval metal/rock band. I have no idea how many instruments this gentlemen masters. But it’s incredible to experience, In Extremo always put up a good show with pyrotechnic and so many different bagpipes, trombones and tools so old that you thought it would have been extinct since antiquity. 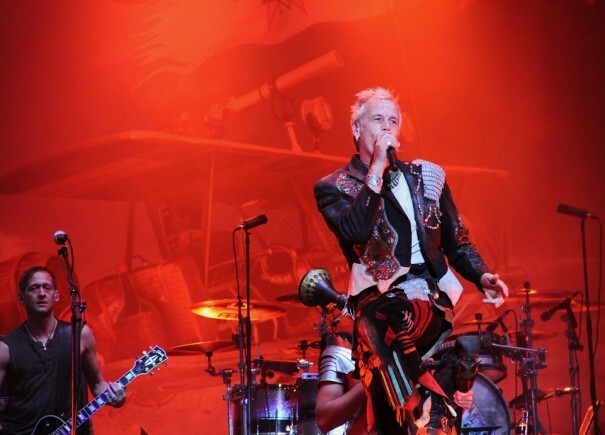 Very few band blends modern rock/metal like In Extremo and is a must see show at least once. After In Extremo we headed back to the VIP lounge area, regrouping with friends and foes over a couple of beers trying to digest the performances of black stage headliners. The VIP area is located next to the main stages with a bridge that connect it to the festival area. A great idea that save lots of time if you wanna photo the bigger bands. However Wacken doesn’t allow system cameras into the main festival area unless you´re applying for it, and upon check-in you get a special photoband. Do not lose that one. Saturday the last day the weather turned worse in the afternoon and most of the day it rained and turned the camp area with more mud. A parallel to compare with was the trench wars in the first world war, but instead of mud dieing. 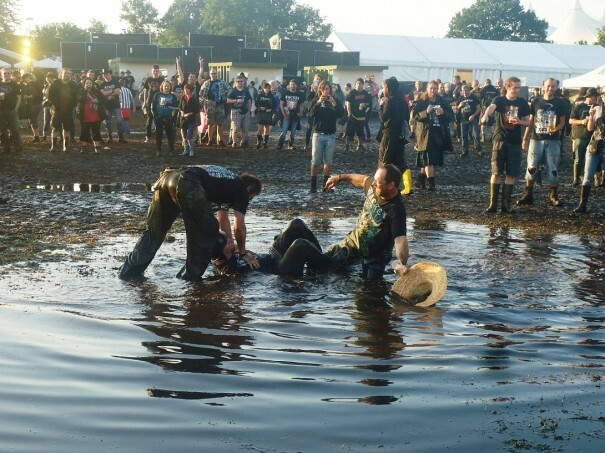 Wacken had mud diving, Instead of bullet rain and cannon fodder, mostly of the people seemed to enjoy themself in the mud, the blood and the beer. We randomly encountered the marching heavy metal band Blaas of Glory playing in the central of the village at noon. Ace of Spades, The final countdown, Enter Sandman hilariously covered. BoG make rock history in their very own style in great fun and joy. Over the entire village rubber boots were sold, and probably boosted German economy on world stock with 10%. We spent mostly afternoon at merchandise area and beer gardens. The beer is cheap and comes in nice plastic glasses with different metal motives, easily a cheap souvenir. 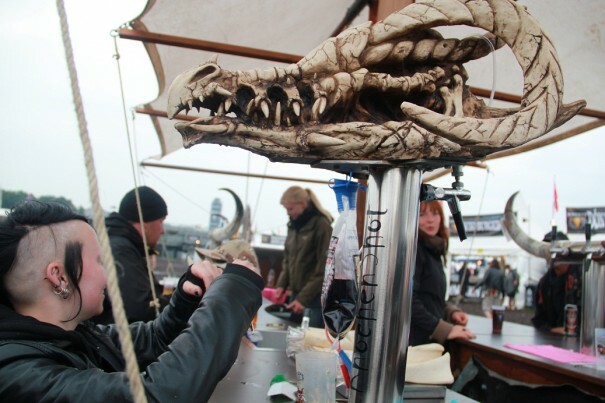 They even got a dragon ship that serves mead and blood beer! If you cant find your stuff at the merchandise area, you probably never find it. Everything from sunglasses, medieval leather corsets, swords, shields, axes, alternative clothing you name it they most likely have it. 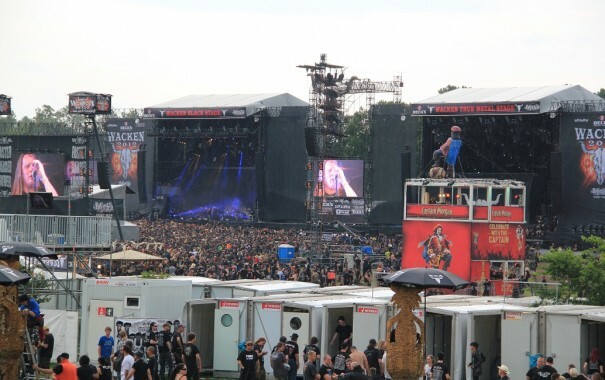 Wacken should in our opinion be hold for a five days. When 80000 people with a common interest of metal music gather around it gets very intense and fast. It would have been a better choice than 3½ days. During Saturday lots of band crashed cause of the tight schedule. 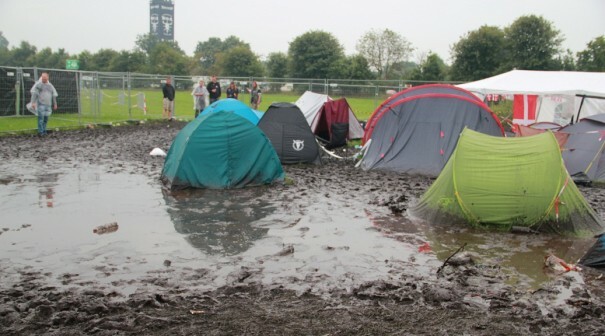 Since the mud slowed down your mobility, your chances to see an entire show of two bands on different stages were strictly limited. We decided to choose Watain instead of Ministry during the late hours. 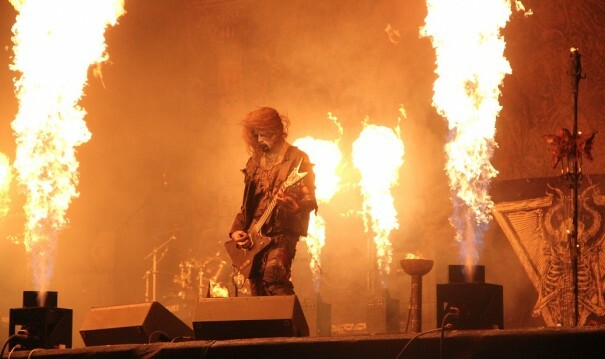 Sweden’s most conservative and fearful black metal band Watain summoned the five elements and melted it together. Huge earthly mudpits with water, open air, and firestorms from the pyrotechnics with a dark spiritual feeling. Watain might just stepped up from the dark underground hellhole to the bright lights on bigger stages, headlining over Europe. But still keeping the magic, darkness and mystic from their shows highly alive. Frontman Erik Danielsson is the harbinger of darkness no doubt. 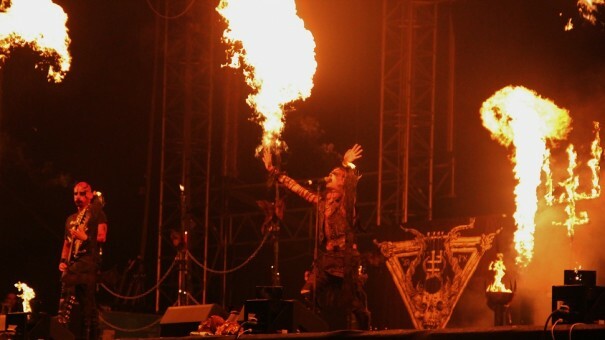 Watain‘s music and lyrics touches all your senses. And even if you´re not believing in the dark chaos gnostic underworld, you will not leave the performance unmoved. There were alot of bands we missed this year and some rare jewels and headliners that we just forgot about like Coroner, Testament, Gehenna and Chtonic. 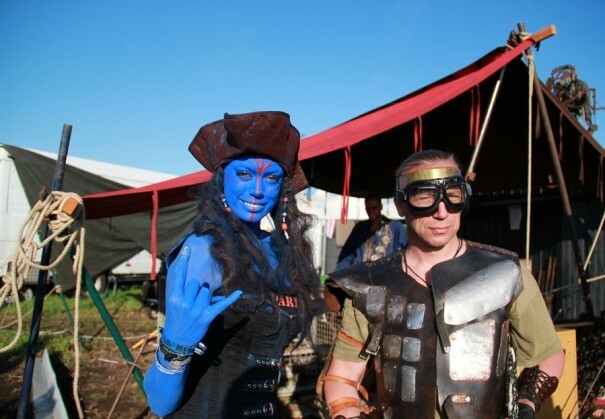 But as every year in Wacken you’ll get lost with the endless possibilities. 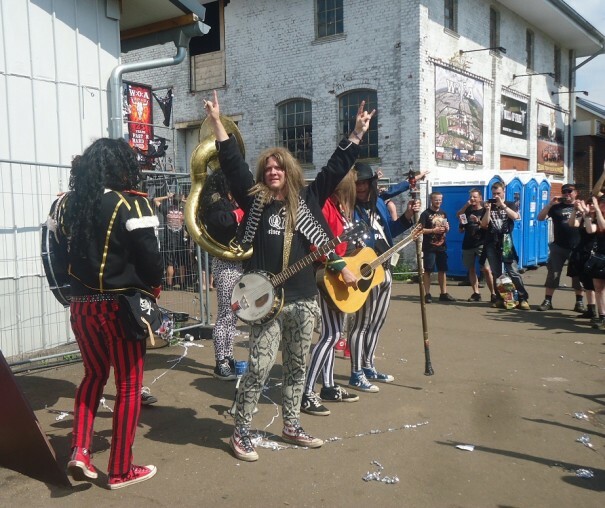 Over twenty years has passed since Holger Hübner and Thomas Jensen first had the pioneer idea to start a festival for heavy metal fans. Around 700-800 people came. 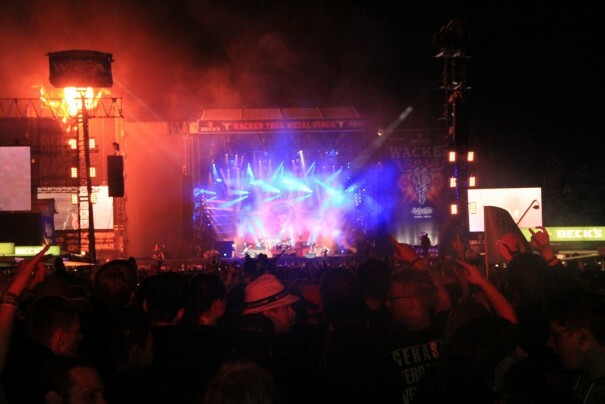 Now 23 years after Wacken has become a colossus among metal festivals and is a well organized, very friendly festival with an extreme loyal fan-base with all kinds of metal and folk music on the stages. And it doesn’t stop there. You have the Full metal cruise in May hosted by the people behind this giant festival. Plus Hamburg Metal dayz 20-22th of September. 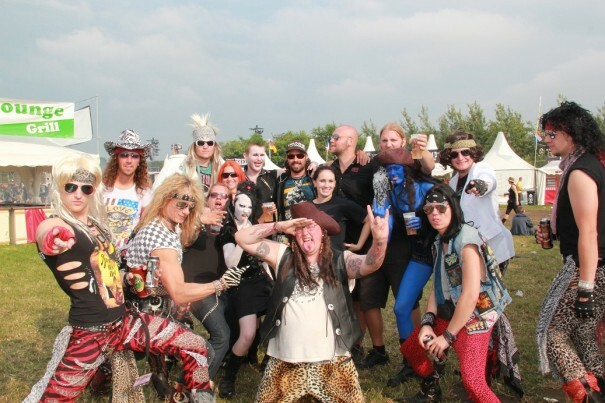 Wacken, also known as the holy ground or the headbangers Meccah, have become a cult festival for metalfans all around the world. Since 2007 it has been sold out, and tickets goes at an alarming rate. So get your tickets fast. For Wacken 2013 the tickets will be personalized, preventing the secondary market and hustlers for selling fake tickets. While you reading this over 50000 tickets is sold and top acts for next year is already released. 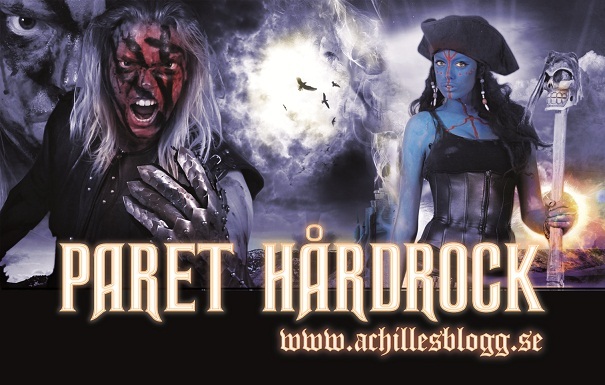 Deep Purple, Anthrax, Sabaton, Nightwish, Arch Enemy and Doro among others so if you want to become a part of the giant party, one the seven wonders in metal history that burns the August sun… Dont wait for to long.